In the village of Kanyana, almost bordering two different states, is Kammaje house. Its a sprawling two story structure, classically built. To reach here, you would need to deviate from the road close to the Kanyana bus station. A winding road, a kilometre long would take you to the house situated at a much lower elevation to the road. As the road twisted and turned, you’d see the structure come into view. You’d bypass the route to the fields to get into the massive front yard of the house. My grandmother’s riot of hibiscus would be the first to greet you. 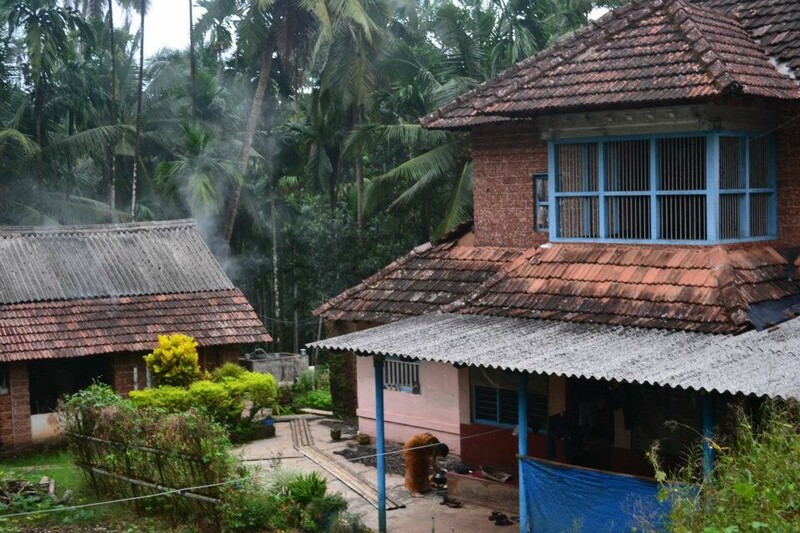 You’d then see rows of support for vine vegetables on your left and arecanut drying on the ground on your right as you walked towards the front of the house. As you made your way around the house, the west had the main washing area with a modest water tank. The bathrooms were near to that. Towards the back were the cow sheds from where Lakshmi, the oldest of the herd, would sense you’ve arrived and give out a loud moo. As a child, on your summer holidays, visiting from the city, there were a few activities you could do around the house. You could get bored out of your mind as your mum wouldn’t let you go out in the scorching midday summer sun. You could collect dried banana leaves from the fields and feed them to the young cows and possibly have idle conversation with them. They’d huff and lick as they consumed the tender juicy leaves. You could eat mangoes, provided you went to the tree and collected them yourself. Or you could watch the monsoons as they hit time to time and cooled down the whole area. The mango tree that I loved was located right on the edge of the front yard. It was a rare breed that my grandmother was especially proud of. She’d have the mangoes cut off at the right time and slowly ripen them inside rice baskets. These mangoes are some of the most delicious ones that I’ve had in my whole life. But they were rationed and not available all the time. There was another huge tree in the field itself, but those mangoes were slightly bitter and not to my liking. The one I like best was in the woods outside the house. Typically it would take you about 20 mins to reach the tree on the main pathway, but we knew of a shortcut. It was a partial tunnel type of path with high rock walls on both sides and open at the top. My mom was the one who showed me this path and it took only 10 minutes to get to the tree if you went this way. This mango tree was a wild one. It wouldn’t look good in your front yard. It was huge in size and so tall you couldn’t see its tip. Mangoes hung from it everywhere, all of them hopelessly out of reach. You’d see kids throwing stones at them with no results. Monkeys couldn’t climb it as it had tons of red ants crawling all over it. So all you could practically do, was wait for the ripe mangoes to fall. Kids all over the village came to the tree looking for mangoes. The land it grew on belonged to my grandfather, me and my cousins would chase any other kids we saw, but they always persisted because the mangoes were that good! Early mornings were consistently the best time to collect the fallen mangoes. On good days you could fill a large basket and get about 5–6 kgs of fruit! But the best time to get fruit was just before a thunderstorm. We’d see the clouds, the wind would lash before the rains started. We’d gather all hands and run to the base of the tree with at least 3 baskets. Mangoes would pelt from the sky as the clouds darkened. We’d frantically collect all of them and fill up the baskets. Just as the skies opened up to pour torrentially, we’d hoist the baskets up to our waists or heads and start sprinting right back home. We’d come back drenched to the bone but baskets choc-a-bloc with mangoes. Our reception was that of heroes. My mom and my aunt would wait for us with towels as they’d quickly collect and inspect all the mangoes for sorting. We’d change to dry clothes and sit in the small yard behind the kitchen in a circle to eat the spoils of our conquest. It’d be a mango eating competition, enveloped by the sounds and smells of summer monsoon in my grandmother’s house. Mangoes and monsoons was originally published in In my time of living on Medium, where people are continuing the conversation by highlighting and responding to this story.